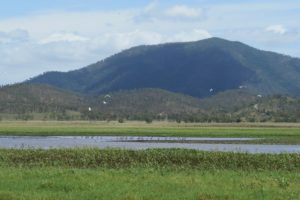 Healthy wetland environments support Queensland’s primary industries and are diversity hotspots for plants and animals. A Queensland Wetlands Program partnership with the Fitzroy Basin Association has developed three case studies to showcase wetland management on beef cattle grazing properties in the region. Learn more about how the five grazing properties that cover the Torilla Plain (PDF 1.02 MB) have developed productive and resilient enterprises for breeding and fattening cattle, how the Broadmeadows commercial and stud cattle business applies management strategies to reduce soil erosion on the Nankin Plain (PDF 1.13 MB) and how the managers of Calliungal Station (PDF 1.3 MB) have tackled the challenges of the floodplain grazing and applied technological innovations to achieve sustainable production while retaining healthy wetlands and biodiversity.